Here is the 2012 Giller Prize shortlist. Reviews of all but Will Ferguson’s 419 are already posted on KfC — click on the title to go to the review. Inside, by Alix Ohlin : A Montreal psychologist comes across a failed suicide attempt while cross-country skiing on Mount Royal, setting in motion a plot that has her exploring that individual’s life, reviewing her own failed marriage and recalling a young patient. Ohlin develops each of the three story lines independently leaving the reader to fill in the spaces in-between. The Imposter Bride, by Nancy Richler: The novel opens with an “arranged” wedding in Montreal: the Jewish refugee from wartime Europe who has been rejected at first sight by the man who was paid to marry her so she could get into the country is marrying his brother instead. There is an uninvited guest at the wedding: a relative of the dead woman whose identity the bride adopted when she came across the body and took with her a diary and a strange rock as well as her identity papers. The novel isn’t about that past, rather it is the story of what happens as those elements become known to the participants — all told from the perspective of the child whom she abandons at the age of three months when her story is discovered. 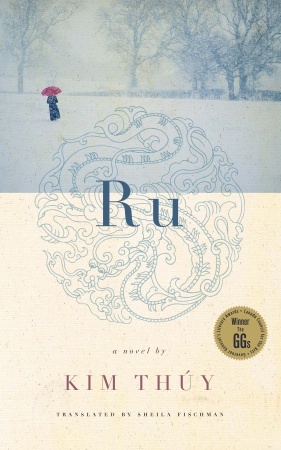 Ru, by Kim Thúy: Translated from the French, Ru won last year’s Governor-General’s award in the original version. Told in vignettes, it is the story of a child who escaped Viet Nam with her parents following the war and ended up in Montreal. The narrator is now an adult — the short novel is both a stream of memories of that escape and the story of how she came to maturity in Canada. Whirl Away, by Russell Wangersky: The only short story collection to make the list, I said in my review that four were excellent, four good and four not to my taste. Most of the stories are set in Wangersky’s Newfoundland, although my personal favorite is centred on an amusement park just outside my own hometown of Calgary. For the most part, Wangersky’s stories feature ordinary people who have to come to terms with a dramatic event, often violent, that suddenly changes their very routine lives. I’ve read 10 of the 13 longlist titles (and will eventually post reviews on them all). Richler and Onstad would have made my shortlist — I’m less sure about Thúy and Wangersky. I didn’t have a particular favorite on the longlist — overall, I thought it was weaker than in recent years and I think the shortlist reflects that as well. Stay tuned for reviews from Kimbofo and Trevor (and comments and guest reviews from Alison) — I will be posting excerpts here when they review the shortlist titles. My prediction is that the Shadow Jury is going to require some discussion in deciding who gets the nod for the 2012 Shadow Giller winner. This entry was posted on October 1, 2012 at 10:15 am and is filed under 2012 Giller Prize. You can follow any responses to this entry through the RSS 2.0 feed. You can skip to the end and leave a response. Pinging is currently not allowed. I thought 419 was very powerful, but I also thought that it was a dark horse and not likely to make the short list. Wow! I haven’t read it yet, so I can’t comment. My fellow Shadow juror Alison said she thought it would make the shortlist, mainly because it was more ambitious than most of the novels on the longlist. This jury does seem to have a preference for the introspective, tightly-defined kind of book, as opposed to the sweeping epic — the other three novels fit that definition and Wangersky’s short stories tend towards that description as well. I can’t say that any of them seem particularly appealing, it looks like an uninspiring list to me. I usually read the winner of the Giller eventually but I’m not sure about this year. Lisa: I certainly wouldn’t recommend that you try the entire shortlist, given your full reading schedule. I do think that The Imposter’s Bride might strike a chord with you. I still stick with Inside being the only one I’m interested in. I must admit, gentlemen, that those two look the most interesting. But I look to the Giller to be ‘Canadian’ somehow, something that introduces me to aspects of life in Canada. I know that’s not one of the criteria, but still, that’s what I’d like. The reason that I suggested the Richler is that I think the experience of post-war Jews who made it to Canada (as “not so welcome” immigrants) has some parallels in Australian experience — sometimes seeing it through a different set of lenses is of value. I’d agree that Ohlin’s reflects another aspect of the “Canadian” experience (her husband heads off to the Arctic on temporary assignment when his next relationship breaks up — the ultimate Canadian copout escape). Ah well, now you’re starting to tempt me, Kevin! Viet Nam, Quebec ended up with more Vietnamese emigres than might have been expected. Well, I’ve read two of the shortlist – one I’m very pleased to see there (‘Inside’ which I liked a lot), one less so (‘Whirl Away’ which I found a bit ho-hum in the main), and I shall probably read ‘Ru’ before the winner announcement. The other two I won’t get to before then – ‘419’ doesn’t really appeal to me and I’ll probably wait a few months for the US edition of ‘The Imposter Bride’ which should be more readily available in the UK. Cary Fagan’s book arrived the other day though, and I’m looking forward to that (I’d have started it already, but having just finished Nathan Englander’s ‘What We Talk About When We Talk About Anne Frank’ I didn’t want to follow it with another collection of Jewish stories for fear it might suffer in comparison). Am I right in thinking the GGLA shortlist is announced today? It will be interesting to see what is on that and if Alix Ohlin can make it three out of three. I have to say I find the Writers’ Trust shortlist far more appealing than the Giller’s and have Tim Bowling’s ‘The Tinsmith’ near the top of my tbr pile. David: You are far ahead of me on short story collections, but I too wonder about the two longlist choices. I’ve now finished Fagan (a cold set back my scheduled review but it will come soon) and it was a good read, but nothing more. In defence of the jury, though, I would say that I could understand why either he or Wangersky could “hook” someone early with a story and produce a firm advocate — both are consistent if nothing esle. The G-G list is out today — I’ll come back with a comment later when it does. So Hough becomes the only Giller longlister to make the G-G list, just as Ohlin was the only one to appear on the Writers’ Trust list. But both Dobozy and Spalding make the G-G and Writers’ Trust. I have only reviewed the Hough and Lam — did not find either exceptional, although both had their strong points. I do have both the Snyder and Spalding on hand and intend to get to them as soon as my Giller reading is completed. Both have received good reviews and were regarded as Giller possibles — as much as I have found this year’s list weak, I have to admit that I have not read very many books that I thought the judges should be criticized for overlooking. And I must scout out Siege 13. The spread on the shortlists for the three prizes tends to confirm my impression that this is a pretty “even” year for Canadian fiction — last year both The Sisters’ Brothers and Half Blood Blues made all three lists, Lyon and Hage were on all three in recent years as well. Unfortunately, in my reading so far, that “even” seems to be a notch or two below the best books of recent years.